Hmm....I think I'll need to come up with a better name. What is finger millet? Otherwise known as African Millet or Ragi (Indian Millet), it is still millet that will vary in color from brown to black and it lasts a very long time in storage without insect damage, which makes it a popular crop for worldwide use. I find my Finger Millet Flour at the local Indian Food store. In fact, I find many great gluten free flours this way and the prices are very reasonable! The downside is that they almost all contain labels that say they are processed in facilities that also process wheat. So, for some this may not be an option. Our batch of finger millet flour has plenty of specks of black, which you see in batter as the speckles. A little fun fact about Finger Millet is that is has Methionine, which is lacking in diets of many vegetarians. 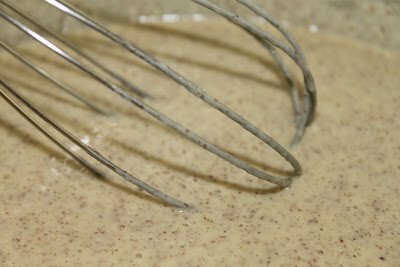 So, with our millet, we increase the iron, fiber, and protein in this batter. The almond flour / meal also increases our protein and fiber. Each of these grains has a unique nutritional profile that makes it valuable. 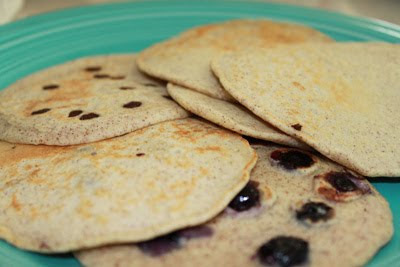 So, we tossed some blueberries in here....some mini chocolate chips in there and came up with some delicious pancakes to call our breakfast this day. This is a thinner pancake then some of our others, such as our Squash Pancake, seen below. The taste and texture were great, though. The blueberry version was my favorite.